The first woman to win the Iditarod!! I have been involved with sled dogs for over twenty years. I grew up in a family that always had a lot of animals around, and I dreamed of someday having a ranch, so I could have even more. When I moved to Alaska I could see that sled dogs were the best kind of animals to have here, and so I started collecting them, with no intention of racing. After two years of learning mostly by trial and error, a friend talked me into racing a 5 dog race, which I won. Then I started thinking maybe I could run the Iditarod. I raced in 1980 & 1981, and then moved up to the village of Teller and joined forces with musher Joe Garnie. A few years later, I came back to the Iditarod with a home raised team, half Joe's dogs and half mine, and became the first woman to win the Iditarod. 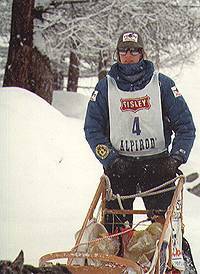 I have raced many different mid-distance races, and also participated in the European Alpirod several times, as well as the International Rocky Mountain Stage Stop Sled Dog Race. I have also raced the World Championship Sprint Race in Anchorage twice, the Woman's World Championship, and most recently, the Ekwok Women's Championship. 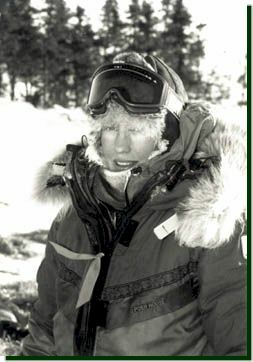 I was a board member of the Arctic Winter Games International Committee for seven years as a representative of Alaska., and have written three books about my experiences. Giving lectures for corporations and also school presentations about the Iditarod is another way I support my kennel, and promote the sport. Iditarod mainly, but as I said above, I have done all kinds of racing. I got my first dogs in 1975. A general love of animals and the outdoors. Also seeing the World Championship Sled Dog Race in 1974. I'm not sure that I remember my very first time on the runners, but my first year was a nightmare! Inexperienced dogs, inexperienced musher, and many disasters. Things got better, though, fortunately. I was also trying to learn how to run dogs up in the mountains, so the trails were not exactly ideal. When I first got into dogs, I got information and even some veteran dogs from mushers Patty Friend and Rod and Allen Perry. They worked with Gerry Riley and had dogs from him as well. Right now I have around fifty dogs. The largest my kennel has been is sixty five dogs. The dogs get watered with cooked fish and maybe liver or beef in the morning. After a run, they get more baited water. Each dog is trained to run back to their dog house loose, and then get their scoopful. When it is colder or they are in more intensive training, they get a piece of meat, beef or moose, after a run. For dinner, they get a top commercial food, currently fed dry, for easy measurement, then we go around & give them a scoop of cooked fish & rice, with beef & chicken added, also bone meal, brewer's yeast, vitamins. If it's really cold or hard training, we may give them one more watering an hour or two later. We also use corn oil & lard, and sometimes lamb for fat supplements. The way I am most comfortable managing my kennel is where the dogs come first. Competition is fun, and helps pay for my sled dog habit, but has never been the main focus. I just enjoy having the dogs. I raise few pups, make the most of the ones I have, and keep most of my dogs into their social security years. When I sell dogs, I carefully scrutinize buyers to find those who will provide the best homes for the dogs. My dogs have lines from Reddington, Riley, Wright, Christman, Beatus, Attla. They tend to be houndy, shorter haired dogs. Good angulation, a dog that is not too extreme in any department. The bottom line is how they perform in the harness though. About the only requirement I have is that they get over a desire to fight, if they have that. I view myself as a coach of the dogs, and they all have different mental and emotional skills. I have to figure out how to make each dog reach it's best potential, one of the most satisfying aspects of the sport. Most of my dogs tend to be very enthusiastic screamers, and like a lot of affection. With my training methods, I have very few dogs getting sour, or wanting to quit. Inca was one of my favorite dogs, she had such a great personality. Her grandfather was one of the first good dogs I ever had, a leader from Rick Swenson, named Solo. Her father was a sprint record holder of Jim Welch's. 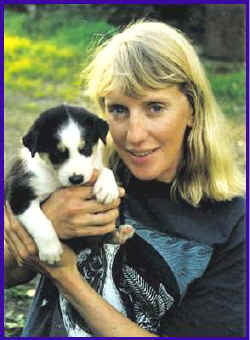 She was born in Teller in 1981, and finished on my winning Iditarod team when she was just two years old. Her goofy personality is what made her one of my favorite dogs...that and her connection to me. She was the first husky I ever had that would actually stick around when I took her for a walk! I always used her to walk puppies with for that reason, then the pups wouldn't gang up and take off for points unknown. I liked her enthusiasm! When it was time to hook up dogs, she would tackle me with all four feet off the ground, we'd make a game of it. We were both born on April Fool's Day. In February, 1999, I had to have her put to sleep, she was almost 18 years old. I have many of her pups, grandpups and great grand pups in the yard. Another favorite dog is Beast. I got her up in Nome. The whole litter was so wild the only way to catch them was to throw dog food in a fence and close the door after them. I liked the looks of her and the challenge, and traded a few bags of dog food for her. I didn't have other pups to raise her with, so she got to grow up in the house with Axle, another of my favorite dogs. She is merle colored with a split brown/blue eye. Her background is interesting, as she is out of herding dogs brought in to Alaska to work reindeer with, and those dogs were bred to native village dogs. She also has some wild dingo in her. She is very different in her head from my huskies. She is a one person dog and has strong guarding instincts. She is very fast, a good leader, but also a great pet. I've used her in a number of commercials, and she is the dog that gets to ride in the Dodge with me wherever I go, and gets full house privileges. If I introduce a new line into my yard, I prefer to mix it with the dogs I already have, that way the pups fit in better. I also breed for a pleasant personality, dogs that don't fight & aren't spooky. Not really, but I spend a lot of time with the pups, taking them for walks, teaching them to get used to being handled and such. I believe in doing it in small steps. I let the pups run free until they start wandering too far. Then I tie them up in an area separate from the main yard. When they get used to that, I tie them along the out-going trail chute, so they can watch the big dogs take off. The next step is to let the pups run free with a small team of old dogs who won't be bothered by them. Then I harness them in small teams, either with a mellow old dog next to a pup, or single, without another dog next to it. If a pup gets scared, I let it loose immediately. To start a pup that gets scared, I walk it out the trail a half mile, with an old dog, and then hook them both up to a kid's plastic sled to haul me back to the dogyard. It's worked with every slow starter I've had. I take pups on camping and truck trips before they are a year old. Enthusiasm, speed, and pups that focus on me, instead of the other pups. It's different for different pups. Push the limits, but be nice to the dogs. It can be different each season, it's mostly just maximizing the potential for the dogs and musher. Just to make sure the dogs are ready for the conditions of whatever race is on the agenda, whatever that takes. I love the drag mat and my handlebar hand warmers. For training the dogs, my best tool is my common sense. Deciding between what my dogs are best at, what will be a satisfying accomplishment, what is financially feasible and profitable, and what will be fun! I'm good at thorough preparation and dog care. To keep enjoying what I do! An immense focus, and a lot of work. Even more international involvement. I also think Stage Racing will continue to grow in popularity. Manage their kennels in a humane way, volunteer to do school and non-profit presentations. It's important for clubs to tailor their events towards the people in their area, and then to gradually expand to where members will gain more experience. Work with an experienced musher for a season before you buy any dogs. It will give you an idea if owning sled dogs is really right for you, and also save you a lot of time in learning. Sometimes you can work out trades for breeding as well. I recommend that new mushers refrain from breeding any dogs themselves for a few years, until you find out what type of dogs suit you best. Racing in the European Alpirod race gave me tons of good new war stories. 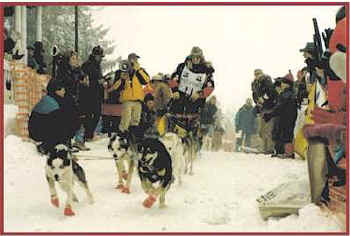 I had run the Iditarod four times by the time I went over to participate in the first Alpirod. I thought I'd seen some of the wildest trails possible, but the trails we raced over there were incredibly dangerous. Kathy Swenson broke her collarbone, Martin Buser and Tim Osmar went over cliffs, another musher broke his hand. The trails switchback through the mountains, sometimes we were even racing on down hill ski slopes. The Iditarod has some rough trail, but it wasn't until I raced in the Alps that I found myself screaming on the back of the sled in a state of sheer animal terror. I sure learned how to fine tune my sled driving over there. I developed what I call my "Courmeyieur (sp?) turn". There would be a hairpin turn to the right coming up, and I would softly tell my dogs "haw" a few times right before the turn, and then at the last moment, when the sled was near the corner of the turn, I'd sharply yell "gee!" and we'd swing the right way at the last crucial second. Joe Runyan crashed on one of these turns and was dragged behind his sled with his snow hook in his leg. Once, I was coming up to a turn that was almost a complete 360 degree come around and I was practicing my new-found screaming skill, as we were also tearing down hill at the same time. Sonny Lindner was one of the race judges, and they'd positioned him at this particularly nasty turn to recover any corpses, I suppose. Anyway, it was good to hear him yell after me as I somehow slid around the corner, "It's okay, Libby, all the guys were screaming too!" After racing the Alpirod, every other trail I've raced has seemed tame in comparison. I just want to encourage mushers to attend symposiums, read books, and seek out other mushers for advice on the best and most current methods of training and caring for their dogs. Dog mushing is wonderful sport, mainly because the dogs are such wonderful creatures. We owe it to the dogs to treat them as well as possible.